One of the world's deadliest and fastest acting viruses, Ebola infections are characterized by high-grade fevers and uncontrollable hemorrhaging. The Ebola virus is deadly and contagious enough to require doctors treating it to wear full-body suits of protection, lest they become infected themselves. The Ebola Virus disease is an acute, and often fatal, illness, characterized by the rapid emergence of fatigue due to fever, stomach pain, headache, muscle pain, and sore throat. Internal and external bleeding, impaired liver and kidney function, as well as rashes, diarrhea and vomiting usually follow within 2 to 21 days of infection. As the virus gets circulated through the bloodstream, it destroys vital organs and, most importantly, weakens the immune system, causing a drastic decline in the levels of blood clotting cells. The inability to clot in turn results in severe and uncontrollable bleeding. Ebola is not as easily transmitted the common cold or flu, but has been reported to have killed about 90% of the people infected by it. Fruit bats have been thought of as the first natural host of the Ebola virus, which was then introduced to humans by way of close contact with the blood, fluids and secretions of animals they had infected, such as monkeys, antelopes, gorillas and porcupines lying dead in the rainforest. Human-to-human transmission then occurs via direct contact with bodily fluids of infected persons, as well as through contaminated surfaces like towels, beddings and various articles of clothing. Many health care workers have been known to become infected in this manner, especially in hospitals where precautions are not stringently practiced. In many countries where burial ceremonies involve touching the dead, the Ebola virus has been known to be transmitted to mourners. To this date, there are no known or proven treatments for Ebola Virus Disease (or EVD). Survival can be greatly enhanced, however, with the administration of supportive care hydration, via the oral or IV route. Fatality rates for different cases of the ebola virus have ranged between 25% and 90% among those infected, with an overall average fatality rate of 50%. At present, no vaccine has been licensed for release to the public. 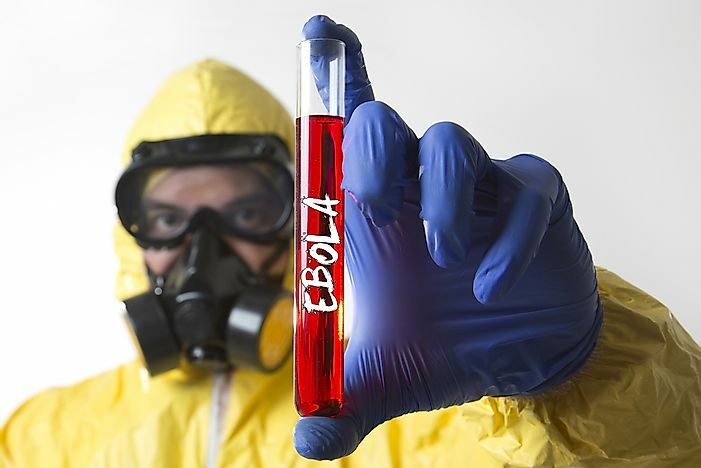 However, there are two potential Ebola vaccine candidates currently being evaluated by the Center for Disease Control. According to the latest figures provided by the World Health Organization, 9,976 people were reported to be dead from among the 24,282 cases seen in the recent (March 2014) outbreak in West Africa. The 2014 outbreak in West Africa is the biggest and most complicated Ebola outbreak since the disease's first discovery back in 1976. As a matter of fact, it has surpassed the total numbers from of all the other outbreaks reported during the previous years combined. To date, the Ebola Virus Disease has spread en masse to countries such as Guinea, Liberia and Sierra Leone. Other neighboring countries stand at high risk, as well as more isolated incidences being reported in Nigeria, the United States of America, Mali, and Senegal.